Several Behaviors require a Context Behavior to be active at the same time to be properly run. GoTo Behavior: a Navigation Behavior must be running to avoid other navigating Entities. Steer Behavior: a Flock Behavior must be running to avoid other flocking Entities (Boids). The easiest way to handle those pairs of behaviors is to use a Parallel Operator containing them: this will ensure that both behaviors are running at the same time (unless some specific Start/Stop Triggers are set, obviously). 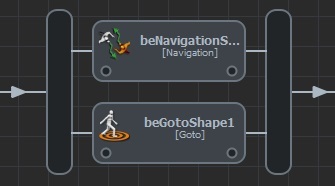 For instance, if dealing with a Go To Behavior, this can be done by creating a Parallel operator then adding the Go To Behavior and a Navigation Behavior to it (or just by drag-and-dropping any of the Behaviors on the other one, as shown here). If others behaviors must be run after the GoTo Behavior, it is necessary to properly configure the Parallel Operator by setting its exit mode to "As soon as one behavior as ended" value; otherwise the Parallel Operator will remain active as the Navigation Behavior has not ended. Also see Behavior Editor controls to know how to easily navigate in Behavior Containers hierarchy.